I knew the Donald had put his name on many things, but I did not know until recently that he had bestowed his awesomeness on a university. 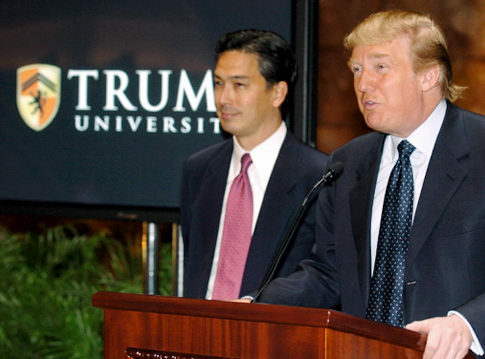 Actually, “Trump University” may not be called that for very long, not because Trump is dropping it but because the state says he can’t call it a “university.” Apparently, the New York Education Department frowns on for-profit, unaccredited institutions using that term, and Trump U. is very much both of those things. Especially the for-profit part, according to a new lawsuit. That lesson, at least, she took to heart, because she alleges she spent upwards of $60,000 on “Trump University seminars” over the course of one year. Well, there are not going to be any heroes in this one. If the allegations are true, people did not get much if anything for their money, but on the other hand, maybe they should have known better. After all, almost everybody who is on “The Apprentice” gets fired, don’t they? Not a great track record of success.